Note: Thurso Surf updated their design. They now have a 2+1 fin setup with two removable side fins. Please note that the pictures show the previous version of the board that featured a single fin. Besides the fin setup, everything else is the same. The paddle board market has been on fire over the last few years with lots of new names emerging. Thurso Surf is one of the surfacing companies in the game, they only have one board available at the moment, but this is soon to change. Thurso Surf sent me over their 11′ Allrounder for a test run. Muchos gracias. The Thurso Surf 11’ falls under the title of an all-rounder in SUP terms. It’s an inflatable (iSUP) and comes with a high-pressure pump. Like the indestructible iRockers, Thurso Surf built their board with the same tough military grade PVC layers on top of a drop stitch internal fabric. Tough, rough and ready to rumble. A comfortable backpack with plenty of support compliments its portability. Roll it up and ready to go. Included are all necessary extras to get you going, as well as a couple of bonus goodies! As previously mentioned Thurso Surf uses military grade PVC layers with a double-layer construction combined with a drop stitch internal fabric. All of this means that the board is extremely rigid and durable. In some cases, more so than a hardboard. Aesthetically, this board is very pleasing. The beautiful wooden stripe appearance would fool you into thinking it was a real timber board if you didn’t know already. It makes this board a stand out from other ranges like the Fanatics, which have all similar designs. Be like a swan. Glide effortlessly and with elegance. The slightly pulled in tail shows off the Thurso Surf’s performance in flat-water with not much drag, and momentum stays consistent once built. The single-fin that comes with the board provides minimum drag and helps the board track straight. 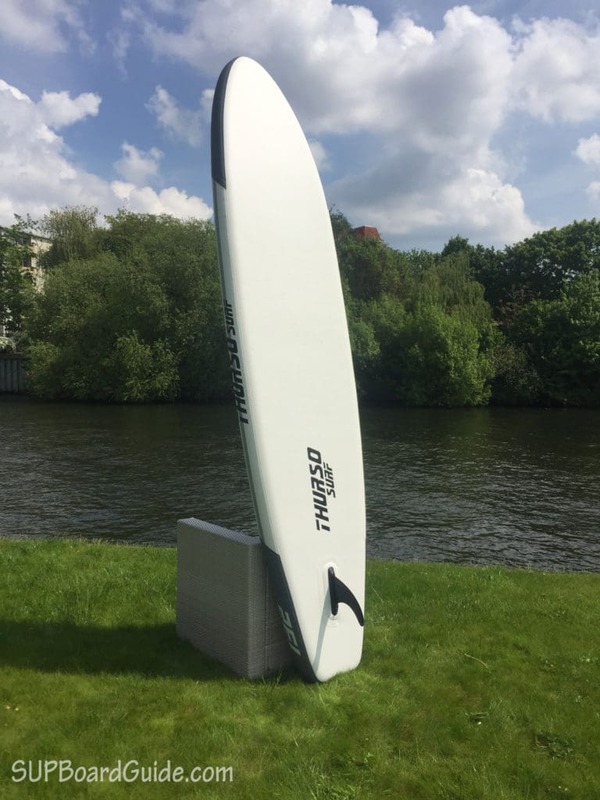 The fin makes the board perfect for flat water cruising or slightly choppy water touring. I’ve not tried it yet, but I’m quite sure you’d even be able to ride some small waves. However, if you really want to get in the surf, you may find the single-fin a hindrance in anything above 1-2ft and would be better off looking at something like the Naish Nalu. 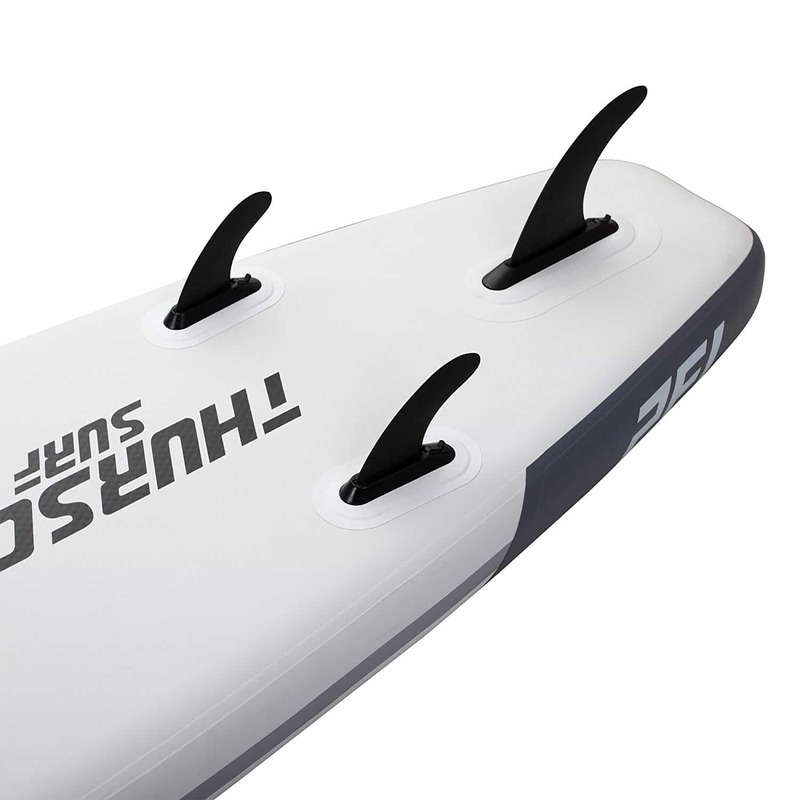 Update: Thurso has already updated their design, and the board now has a 2+1 fin setup. The updated board now has two small side fins in addition to the large center fin. Want to hear the best part? The side fins are removable using the same quick lock system you know from the center fin. That is really rare and a fantastic feature. It means you can get in the waves with a three fin setup or remove the fins for flat water touring. Below is a picture of the new fin setup as well as the single fin setup from before. The inflate and deflate, is a simple process and nothing I need to cover in much detail. You get a high-pressure pump included with easy instructions on the outside. Inflating the board to 15 PSI is pretty quick and takes 5-8 minutes depending on how much of a warm-up you want. 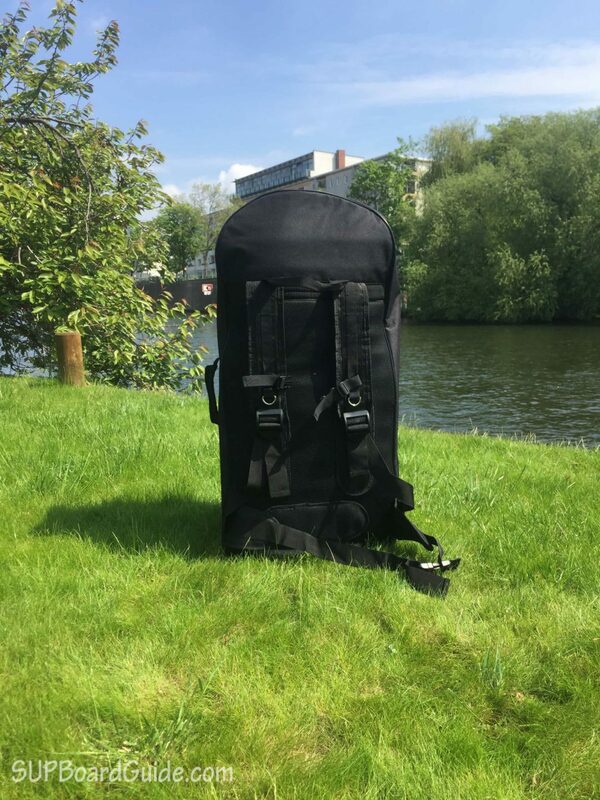 The bag features an easy to carry handle for the short trip and loads of support on the backpack around the shoulders and waist for the longer distances. Again, the materials used are great and certainly above average. Most bags you see in this price range are either a too small, don’t have proper padding or not have cheap zippers. This one doesn’t! The carbon shaft paddle is something worth mentioning on its own as it’s one of the best paddles I’ve come across in the market, particularly in this boards price range. Not only does the paddle float, but it’s also adjustable and noticeably lighter than the competitors. It’s significantly lighter than the standard aluminum paddles and noticeably lighter than the fiberglass ones as well! This lightness is such a key factor for enjoying either a first time experience or long distance paddling. The leash is also included which I really like. 90% of the time you have to buy it separately and being that a leash is essential for safety I really like it when companies include one. I like to take some snacks/gear if I’m going on long distances so having tie-downs is always a bonus I look at favorably. Included with the board is some deck bungees with a 5 D-ring setup right up to the nose for maximum storage space. But the real “goodie” is the included insulated storage bag. It’s spacious and will keep any drinks or food chilled. I don’t know any other brand that includes a quality bag like this. You can usually expect to pay at least an extra $50 for it. Thurso Surf has manufactured a board that will be making some of its competitors squirm in their seats, especially if they continue to produce SUPs at the same quality and price. A mid-range SUP that includes well made necessary extras to get started plus also throwing in some other goodies like it’s storage bag, that also sells at a competitive price is going places. It’s also worth mentioning again the accentuating detail of the wood stripe graphic, definitely a crowd pleaser. 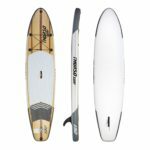 I believe anyone looking to start out or even if you perhaps just want to add another board to the quiver, the Thurso Surf 11’ is an excellent choice at a very reasonable price for what you get. i falter between the irocker sport 11′ and that Thurso Surf 11′. Both got really got reviews from you. What is the difference between these two boards? As i saw the irocker is 2 inch narrower. Would you say it is sportier and faster? 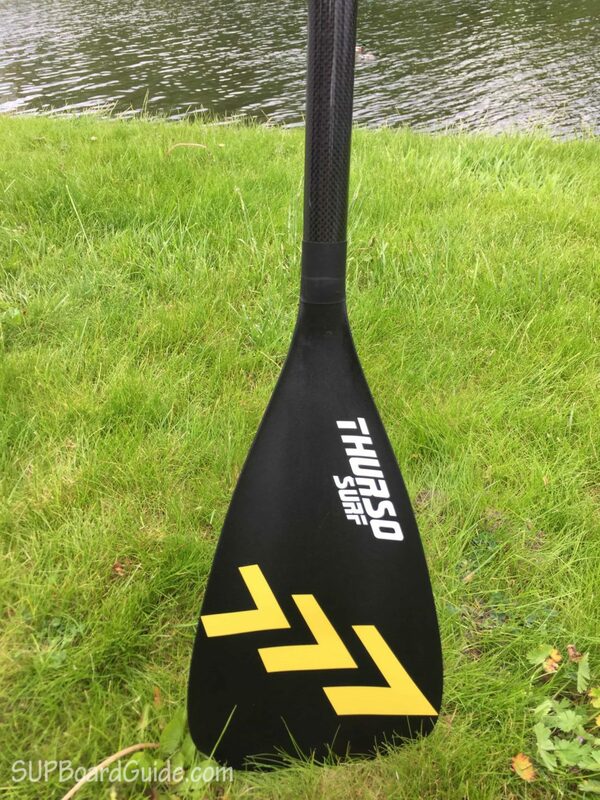 The Thurso has a carbon shaft paddle which could be an advantage. 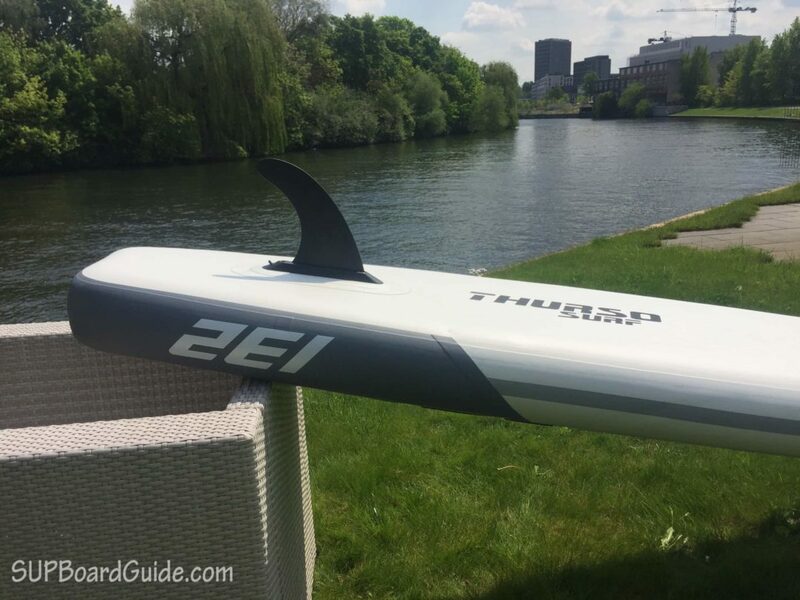 As i saw on Amazon there was a design change on the Thurso, it comes now with 3 fins instead of a single fin. I have 154 lbs. I paddled several times with rental boards but want to have my own now. I will use it mostly on lakes and eventually on a wide slow river (no whitewater). speed wise they are actually very similar. The iRocker is slightly faster but not by a lot and the Thurso is just a notch more stable. 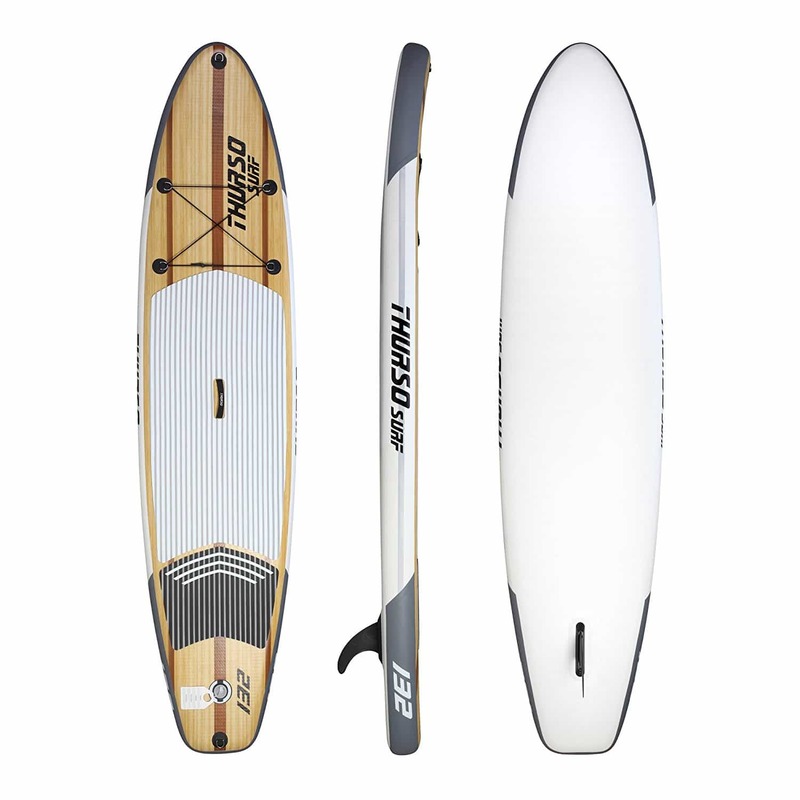 Both are great for flat water conditions and given that Thurso updated their design even the fin setup is the same now. I’d say it really comes down the the extras included and your design preferences since the price is basically the same. The tie down straps on the Thurso can hold a little more gear and it comes with a board bag which I definitely like. The paddle also has a carbon shaft as you pointed out. Definitely an advantage if you want to go for some longer paddles. The Thurso backpack is great. The iRocker Sport is unfortunately still sold with the old backpack I complained about in my review. If you intend to carry the board for a longer period of time you will want to upgrade to the new one which is an extra $70 so keep that in mind. If you basically just throw the bag in the trunk of your car it’s of course not much of an issue. I love your site! Thanks so much. We are a family of four that have a beginner SUP but are looking for an inflatable to take with us out on our boat on a large lake (probably usually relatively flat water, maybe 1-2 foot waves, anything bigger we would probably not be SUPing) to explore around the lake and be more active. We often go out for long periods and I am itching to get on a SUP. Might also be taking it to the coast for vacations but not doing any surfing. Would rather have it be stable and fast on calm waters. I think we are going to start with just one to see how we like the inflatable. My husband has great balance on our 10.5 but he is 6 4″. I am 5’8″ and my daughter who does like to use it solo is about 5’2″ now and growing. Based on your reviews and other sites I am torn between the iRocker All Around 10 or 11 or this Thurso Surf. What would be your recommendation? Thanks! Hi Bethany. Thank you 🙂 Glad to hear that. The Thurso Surf and the All Around 11′ sound very similar on paper. However, their shape differs a bit which makes all the difference. The iRocker is shaped a bit more like an all-rounder while the Thurso Surf has more of a touring shape. That makes the All Around slightly more stable. It also offers a bit more space to bring an extra person. The Thurso Surf on the other hand, is a little faster. For your husband at 6’4″ an 11′ board would be ideal. For your daughter a 10′ one would be ideal. Given that she’s still growing I’d suggest you go for an 11′ one though. Especially if you’re not surfing any waves and don’t need to do any fast turns she will be fine. The iRocker is definitely a great board, but looking at your requirements it sounds like the Thurso might be the better option. It’s better for flat water cruising and the faster board. Thurso also changed the fin setup. I’ve not had time to update the review yet but the board now also has a 2+1 fin setup with one large center fin and two smaller ones. However, the two side find are detachable which is pretty rare. You pretty much get the best of both worlds whenever you need it. It also comes with more extras than the iRocker. Just to add some extra confusion and make the choice a little harder you might want to check out the iRocker Sport if you haven’t already. It’s the sportier version of the All Around and more geared towards touring and flat water cruising. Thanks! The Thurso does look nice. I am wondering how it will hold up over time because I can only find recent customer reviews whereas it seems I can find a ton of reviews on the iRocker. Also, do you think it would be stable enough to have one child on the the Thurso board as well? You’re welcome. There are only recent reviews because Thurso is brand new company. They launched their first product line this year whereas iRocker has been around for a bit. I’ve only had the Thurso for a few weeks myself so I unfortunately can’t speak to it’s long-term durability. For iRocker on the other hand, I can. However, don’t forget that you get a full 2-year warranty with the Thurso. I honestly don’t think they would offer that kind of quality if they were concerned about quality. Hi! Researching to buy my first SUP. Looking at the Thurso Surf and irocker all around 11′. Will be using primarily on a lake with some chop from boats and an occasional trip to the coast with some small waves. Which board do you think would be best for these situations? Thanks! Both will do fine in both conditions. It’s really up to what you prefer performance wise. The iRocker is more stable and has more of an all-rounder shape. That makes it slower though. The Thurso has more of a touring shape and is a little quicker. I’d say if you want to cover longer distances or like a fairly quick board, the Thurso is the one you’re looking for. If you want to take it slow and maybe want to have your kids play on the board as well, the iRocker is more what you’re looking for. Hi! I am planning to buy a SUP and considering the Thurso as my favorite right now. However, there’s another top notch board, which you apparently haven’t looked at or reviewed yet: The ISLE Explorer 11, coming at a slightly higher price but with some features that seem better and also the brand seems a bit more reputable. Have you seen the board and could you give me your opinion on what to pick? Thanks! Hi, I am probably intermediate and enjoy extended daytrips on flat or slightly choppy water like Lake Tahoe. The boards I’ve been on so far were solid rentals and I always found them a bit slow but very stable, but that’s probably an ok tradeoff since I also wanna be able to take a toddler on the board with me. I’m really looking for durability and a composite paddle at a price tag of 700-800$ with some flexibility. What also worries me a bit about the Thurso is the their website, basically a white page saying something like “sorry we’re soon sold out and no restocking is planned anytime soon”. Doesn’t build confidence in their long-term engagement. That being said if you do want an inflatable and have the extra budget for the Explorer I’d say go for it. It does have a few extra features (extra bungees etc.) and is no doubt a great board. The paddle has a carbon shaft and is not one of the cheap aluminum paddles you get with other boards (The Thurso also comes with a carbon paddle). It has everything you need for touring and handles chop really well. You’re right, Thurso is more of a startup and ISLE is definitely the more experienced company. The reason the Thurso website isn’t online yet is that they’ve just not had the time and have been flooded with orders selling more than they’ve expected. They are also working on a new product line so they are definitely in it for the long-term. I think once the peak season is over they will definitely launch their own site. Hi. I was thinking between Ten Toes Weekender and This Thurso Surf 10’7 board. which one would you recommend? I live in Canada and where I can get these two, it seems Thurso Surf is about 200 dollars more expensive than Ten Toes Weekender. I am planning to use my paddle board mostly in lake, and sometimes small waves in ocean and might ride 2 adults, a male and female time to time. Hey! I’ve been checking your website out for months now but I’ve finally saved enough to buy a good board in the 500-600 range. I read the comments above and I’m picking between 4 (yes, FOUR) SUPs, namely the Thurso, Nixy Newport, iRocker Cruiser/All-around, and the older ISLE 11′ Explorer (the one on Amazon, not their website). These are all relatively the same price, with the Nixy being around 35 bucks more expensive than the rest. 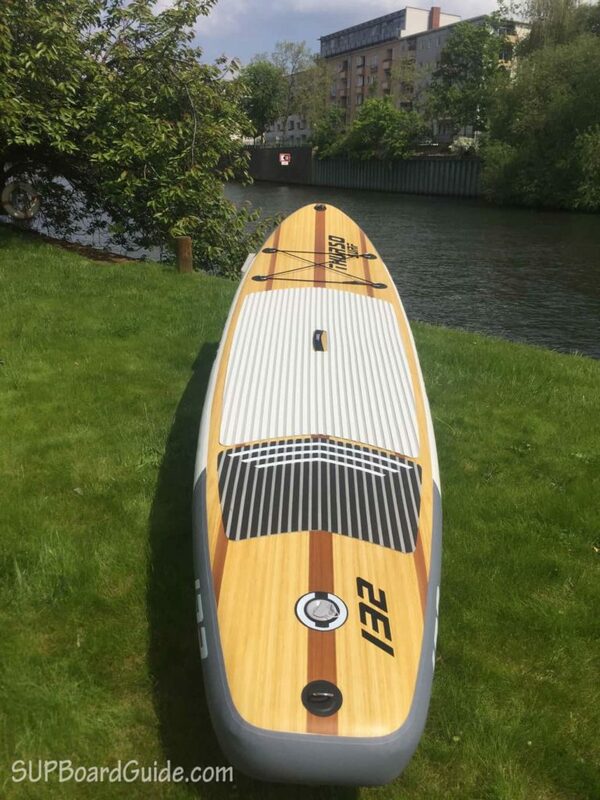 I love the ISLE because of it’s weight and overall design, but I wanted a SUP that had all 2+1 fins removable. This is the only thing stopping me from buying it. So I looked to the Nixy but I’m not digging their paddle much. As it’s the most expensive board out of the 4, I didn’t want to buy another paddle, since the only extra item I wanted to buy was a kayak seat. The Thurso is another option but it’s more than 5lbs heavier. I’d also prefer having bungees in the front and back but I guess I can buy some extra stick-on D rings and put my own bungee. The iRocker, similar to the ISLE, can only have the middle fin removed. The only thing I like better is the paddle (fiberglass, convertible to kayak paddle). Any thoughts or recommendations with what I want in this budget? Basically 500-600 range, preferably all 2+1 fins removable, with D rings to snap a kayak seat on. If you like the weight of the ISLE you will love the Nixy Newport. It’s just 19lbs. I’m not a fan of the Nixy paddle either. In case you didn’t read my review yet you can find it here. The blade is a bit small and the shape takes some getting used to. I wouldn’t think about the paddle too much though. The standard ones included with most boards are fine to get you started. However, after a while, you will want to upgrade for sure. A lighter, higher quality paddle just makes SUPing so much more enjoyable. The Thurso would be the exception since it comes with a carbon paddle. Since you want all 3 fins to be removable I’d say you should either go for the Thurso or Nixy. No need to compromise since you’ve got great options. Nixy: You will want to buy a new paddle at some point. Bit more expensive but lighter. Thanks for the super quick reply!! Between all the boards though, how would you rank them by ride? Taking out the bags, portability and other accessories, which one rides the best on flat and/or choppy water? I’m not sure if you’ve tried the older/2016 Isle Explorer but from your personal experience, which one is the best once I’m in water? the boards do have different dimensions so comparing them is a little like comparing apples and oranges. Let me try to point out the ideal use for each instead. Thurso: Great for flatwater. I would say it’s the fastest out of all the ones you mentioned. iRocker All Round: Not as fast as the Thurso in flatwater but more stability in choppy conditions. iRocker Cruiser: Crazy stable but also a little slow since it’s really wide. If you want to try yoga or fitness on your SUP this is for you. Also if you have kids that want to play around on a stable board I’d go for the Cruiser. To cover some distance I’d prefer a faster board. ISLE: I’ve not tried the Explorer 11 but I know it’s a really good board. Tons of storage and basically indestructible so perfect to take on longer trips. both are great options. I’d definitely go for the 11′ version. They have a little more volume and therefore support more weight and float a little better. A longer board also means more glide and speed but a little less maneuverability. Both the Thurso 11′ and the All Around 11′ are still beginner friendly and easy enough to turn though. The All Around is shaped a little more like an allrounder and a little more stable. The Thurso is the sportier option, more comparable to the iRocker Sport. Love the detail of your reviews, very helpful. Helpful enough to narrow my list down to two boards. The iRocker Crusier and this Thuro 11′ waterwalker. We live on an inland lake in WI where we’ll be using this board. We’ve got two kayaks we use regularly but I want to give SUPing a try. We also have two Golden Retrievers ~60lbs each who kayak with us and I’d love to get them on the SUP as well. I’m 6’2″, 200. My wife is 5’9″ about 145. The lake is typically flat to light chop. From what I’ve read and heard back from the manufacturers (who both responded very quickly with thorough responses) the iRocker will likely be more stable and has quad layer construction, includes a tail handle and has what looks like more deck padding. 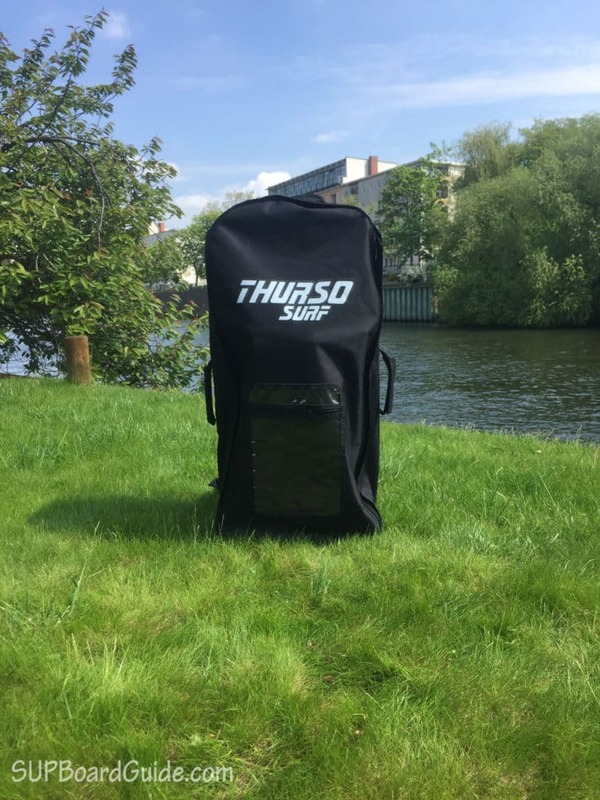 The Thurso will be a bit quicker, has a shape which may be better as we gain more experience, has a better package (carbon shaft paddle, deck pack cooler), 3 removable fins. Curious your thoughts on which way to go given they are priced the same. Does a bit of stability and quad layer construction trump the package, speed and features?? you’ve pretty much nailed it. The Thurso does come with slightly better accessories, mainly the paddle. It’s also a little faster. The Cruiser on the other hand is really designed for relaxed touring and not speed. One thing to keep in mind is that you and your dogs might appreciate the Cruiser’s width. Even though it’s just one inch, the Cruiser’s shape isn’t as streamlined and it feels like more. Another option you might find interesting is the new Blackfin Model X. We reviewed it here. It’s similar to the Cruiser but everything is a little higher quality and the accessories are awesome. It’s 35″ wide so there is plenty of room. Even though it’s wider than the Cruiser it’s as fast if not a little faster. The shape is a little sportier and the pulled in tail makes it faster as well. It is a little more expensive than the Thurso and the Cruiser but definitely worth checking out. I live in Buenos Aires, Argentina and the sea here has small to medium waves and I intend to buy an iSUP that can get me to surf those regularly. Will buy it during a trip to Miami, so international shipping is not a concern. As I’ve seen from your reviews you mostly run in flat water, but still wanted to ask you about some particular surfing-friendly models you can recommend me to take a deeper look, in this price range. I’m 1.85m tall and 90kg, so I’m guessing I need to go for the “larger”, 11′ models. We actually test our boards in a variety of conditions. Anything from flat water to choppy conditions and whitewater. If you will primarily use the board to surf I’d prefer the iRocker Sport over the Thurso. Its shape is a little better and it does have a kickpad which you will appreciate a lot in the surf. However, both boards are really just designed to play around in smaller waves. They are typical all-rounder boards and definitely not ideal for mid-sized to larger waves. If that’s what you’re after check out the Fanatic Stubby. It’s as good as it gets. The Nixy Newport is another cheaper option. No kickpad but it’s shape makes it super easy to turn and it’s extremely light-weight. I used it in 2-3 foot waves without any problems. I’m hesitating between the Thurso Surf Waterwalker 11′ and iRocker All-Around 2018 Review. I try to figure out which one has the better layer fabric. First one says 2 layer and irocker says quad layer. Any hint to figure out which one is the most resistant and durable? Definitely the iRocker. Quad means it has 4 layers while the Thurso has 2. The 4 layers make it more durable. in addition what make the difference between these two board in terms od rigidity? I means the rigidity depends on internal construction rather than the external layering? The core is very similar. Both use a drop stitch core. The iRocker boards come with two extra layers of PVC. That makes them more durable but also more rigid/stiff. The thinner the outer layer the more a board will flex. That’s a very common problem with cheaper boards. They use a drop stitch core as well but usually come with a thin layer of PVC and therefore flex a lot under pressure. We wrote about it here. Hi, I have been looking at a lot of inflatables. I’ve had an inexpensive hard board for several years now and want the portability of an inflatable. I love the look and package included with the Thurso. I had posted a question on Amazon, and no one has answered it yet. I hope you can help! It looks like you’ve had the Thurso since last year. How easy is it to keep the white vinyl clean? I live on an inland lake, so the water is reasonably clean. But owning boats with white vinyl, air pollution, etc stains the vinyl over time. That concern is the main thing holding me back from purchasing the Thurso. keeping it clean is really easy. I usually keep a small towel in the backpack and use it to clean the board once it’s out of the water. The bigger issue is bumping into things. You will hit rocks, wood and other stuff floating around over time and those tend to leave marks, especially on white surfaces. You won’t see it from a few meters away but it is visible close-up. I’m a beginner and looking for an affordable SUP that I could bring my 80lb dog on. We would be doing mostly lake touring paddles. Would you recommend the Thurso vs Irocker? the Thurso is more narrow than the iRocker in the front where your dog will sit. At 80 lbs it sounds like he/she is going to need some space. Definitely the iRocker, better the Model X. It’s a lot wider and will hold the weight in the front better. The performance won’t be affected as much. I have a hard board, but it isn’t conducive to travelling so I want to pick up an iSUP for when I travel. I would like for this one to be pretty versatile because I will be taking it out on the following water types: flat water rivers and lakes with small chop (1-2 ft), rivers with small rapids (class I, possibly II) and some ocean use (up to 3-4 ft surf). I am looking at the Thurso Surf 10’6″. I am 5’9″, 195 lbs, male and usually have a dog on my board (one of my retrievers, 75 and 85 lbs). What are your thoughts on how this board would handle in the above conditions? Oh, I love golden retrievers! Gorgeous! So, this is a tricky one. Up to 3-4ft surf where? Because the Thursosurf is 6″ thick and much more buoyant than a hardboard, it’s not as easy to get through whitewash (as I’ve experienced). So, on points it’s fine but on beach breaks, it’s not the best combination! Red Paddle Co Ride is a reasonable inflatable surf SUP as well rapids but it’s a considerable price leap from the Thurso. It also doesn’t have the same weight capacity (220 lbs only). So it wouldn’t suit your dogs. Like I said tricky one, let me know where you get with it..I’d love to know! Hello, I am looking at getting my first paddle board. We aren’t sure if we want to go with a Thurso surf Water walker, Thurso Surf Expedition or the more durable iRocker. If the I rocker came with a carbon fiber paddle, we would have already ordered the package. We will mostly be touring around on calm waters, maybe some small wakes from boats. Which would be the best fit for us? They are both great companies! I guess it depends on your size as well. The Waterwalker is a great all-around and is on par with the iRocker All-around too. The Expedition is a fun and fast board that also can take a bit of weight! Probably the best choice if touring will be your main activity. I would suggest the iRockers are a little more durable being quad layer and can also take a bit more capacity. Either way, you’ll get a great board! Hi Sacky, thanks for the reply, we ended up going with the 11′ iRocker all around and we are anxiously waiting for there arrival (got the sea foam green one for my wife as well). Looks like they will fit our familys lifestyle and small lake. It seems to be an in between board, which is exactly what we were was looking for. The only two things I will miss from the Thurso, are the removable fins and carbon fiber paddle. I thought the other options from iRocker outweighed these two missing details. I love the standing pad on the iRocker, it looks much more comfortable, it has handles upfront for our son to use and the extra durability was the biggest seller for us. Thanks for your time and I will try and let you know what we think of them, once we get them! Oo I love the sea foam one! 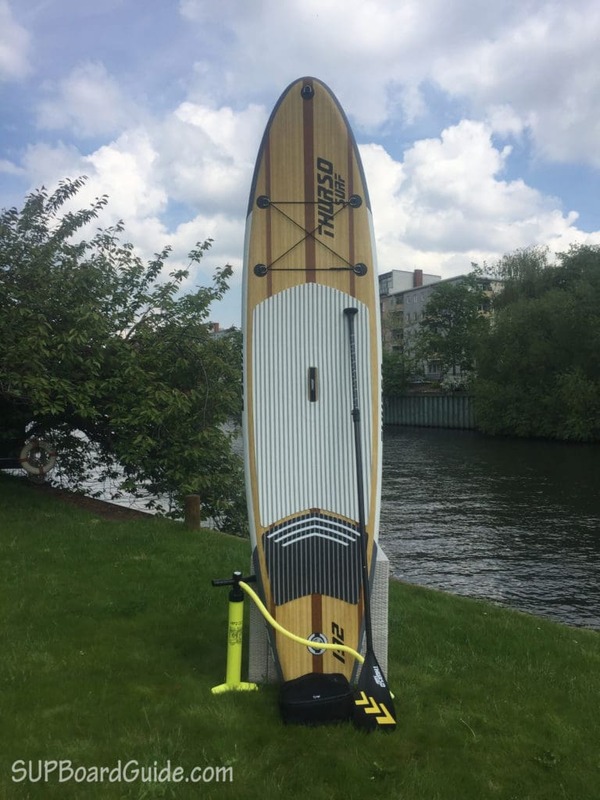 Thanks for the reply, your reviews on the paddle boards are amazing and I really appreciate you taking the time to do them. I am just hopping the 11′ will be okay for my wife. She is 125 pounds and around 5’8″. From all of the reading I have done, it will just turn slower for her. The reason I got the bigger one is we have a child and a dog who will be ridding on our boards. What is your opinion on this? did I mess up by getting her the 11′? Not at all 🙂 It’s true, she may find it harder to turn at first but she’ll adapt I’m sure. It’ll be the more versatile option for everything, so the turning is a small payoff. It won’t be a hugely noticeable difference. Sounds like you guys are in for a heap of fun!